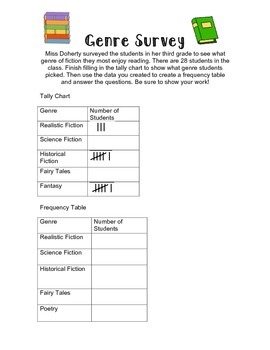 In this open ended problem students are told a teacher surveyed her class and created a tally chart based on the data she collected about book genres. The tally chart is partially filled in. There are 15 tallies, but 28 students in the class. 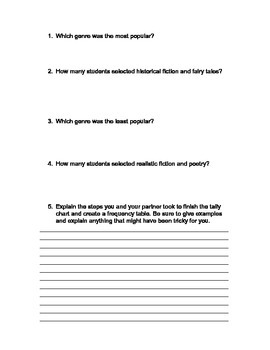 Students must determine how they will finish filling in the tally chart and then use it to create a frequency table. Students will then answer a series of questions about the data. Students could then use the data to separately create a picture graph or bar graph. One they've used their mathematical reasoning skills to fill in the tally chart the possibilities for using the data are endless.